Safety—Cracks turn into potholes, which turn into undercarriage busters, potential injury hazards and liabilities. Curb appeal—Whether you are trying to win new tenants or new customers, one of the first things they notice when they drive onto the property is what they’re driving on. If the parking lot is faded, cracking and has weeds growing up out of those cracks, they might wonder about the shape of the rest of the property. 1. Do you need a full asphalt pavement replacement, or just some spot repairs? If your paved areas are in severe need of repair, then replacing it is most likely the best option; our Espina Paving team can look and give you a better idea of what needs to be done. The good news is that once the new pavement is down, it should, if well maintained, last you nearly two decades. This gives you a chance to plan for other projects and save for the future. 2. How old is your pavement? As previously mentioned, a new, well-installed asphalt area should last up to 20 years, if you keep up with the maintenance schedule. So find out, if you don’t already know, when the last major pavement installation was. If the asphalt isn’t getting close to 15 years yet, it’s entirely possible that some judicious repairs will take care of any issues it has while prolonging its life and saving your budget. 3. How heavy is the traffic? While the average lifespan of a commercial parking area may be up to 20 years, very heavily used areas may need replacement earlier—maybe between 10 and 15 years. It may be possible to stagger replacements of different areas to fit your budget better. 4. How much time do you and your customers/tenants have? It’s not just your budget you have to worry about—business or residential tenants have work to do, business to transact and lives to live. You need to take their concerns and schedules into account so that any pavement repairs or replacements are done with as little hassle to them (and, therefore, you) as possible. Do your research on the best asphalt paving contractors who have the right experience working in a commercial or industrial setting, including those who will pave during off hours so that your tenants and customers can go about their business with as little trouble as possible. 5. When was the last sealcoating done? 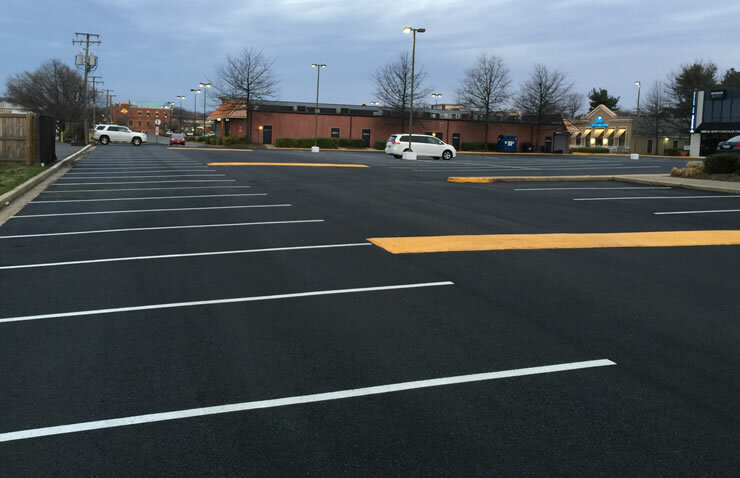 It’s amazing how a regular sealcoating application can make an asphalt parking lot live longer and look nicer. This should be in the budget for every 2 to 3 years – more often in heavy traffic areas. Staying on top of sealcoating maintenance will save you money by extending the life of your paved areas because it protects the asphalt from wear, tear and weathering. 6. How big are the cracks? Cracks between ¼ of an inch to 1 inch can be repaired to protect your asphalt pavement area without a complete replacement project. Vigilant, regular crack filling prevents water from getting into the sub-base and weakening the foundation of your asphalt so that it will last longer. Cracks any bigger than that will start becoming potholes and will need more extensive, more expensive repair or patch replacement. The important thing to remember is that you need to keep a regular eye on the pavement and the schedule when it comes to your asphalt paving budget. Asphalt can last a long time when it’s well maintained and well installed. Just be sure to keep an asphalt maintenance plan line item in the budget each year and stick to it. This will save you money overtime. In fact, one dollar of regular maintenance can save you nearly five dollars of major replacement paving later on. Also understand that if you have large areas that need major work or replacement, they can be done in stages to keep costs more manageable and predictable. Contact Espina Paving at 703-491-9100 if you have questions or concerns about your asphalt.